In making the year-end announcement, BSX President and Chief Executive Officer Greg Wojciechowski stated, “In 2017 the BSX built upon its position as the listing venue of choice for global ILS vehicles. He added, “The accomplishments of the BSX to date and in particular this year’s results, are directly attributable to the hard work of a small, dedicated team of world class stock exchange professionals that manage and operate the Exchange on a daily basis. “The team clearly understands the important role the BSX platform plays in the development of the Island’s domestic capital market and in particular its regulatory role which ensures investor and market protection. This and how all the pieces collectively contribute to the health and development of Bermuda’s economy. Commenting on the year, BSX Chief Compliance officer, Mr. James McKirdy stated, “In 2017 the BSX once again saw positive listing activity across most sectors. As noted, listing activity was particularly strong in international debt and insurance linked securities [ILS] which both reached record levels. “International debt listings grew to 180 securities in 2017, up 55% from 116 the previous year with their nominal value growing from $2.0 billion to $4.6 billion. “Meanwhile, the Exchange saw the listing of a total of 103 new ILS securities in 2017, with a combined nominal value of $11.54 billion. This represents growth of 69% in terms of the number of new securities listed in the year and an 87% growth in the nominal value. At year end the total number of ILS securities listed stood at 227 securities with a total nominal value of $ $25.99 billion.” concluded Mr. McKirdy. The BSX noted, “The Exchange also listed 4 new collective investment vehicles, 3 new equities and 20 new derivatives. A further 9 subsequent issues were also processed by the BSX. “De-listings in the year followed a normal pattern and were mainly comprised of timelimited securities which matured as part of the normal course of business. “At year end the total number of listed securities stood at 865, as compared to 753 in 2016. While the RG/BSX Index closed the year at 2,202.19 up 14.47% over 2016. “Trading volume decreased in 2017 to 3.8 million shares traded. Correspondingly share value ended the year at $40.1 million. “Operationally it was another busy year for the Exchange as the Bermuda Securities Depository [BSD] continued to ensure the orderly settlement of trades and processing of all domestic corporate actions. At year’s end the BSD held 62% of all domestic listed securities in custody, up from 58% last year. IT Manager Ian Havercroft explained further, “Independent surveys of our infrastructure have indicated that the BSX aligns closely with the US NIST Cybersecurity framework and our overall security score is near the highest scores in our industry. 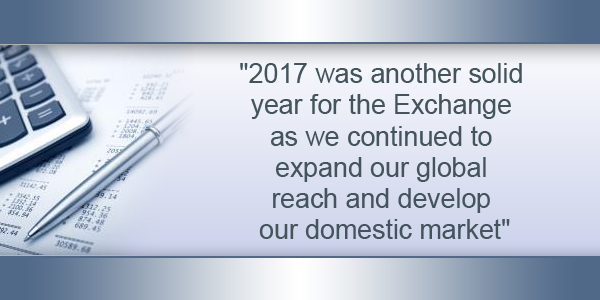 In closing Mr. Wojciechowski stated, “2017 was another solid year for the Exchange as we continued to expand our global reach and develop our domestic market. The focus in 2018 will be continued expansion of our international outreach with a view to creating new strategic partnerships that will enhance the Exchange’s global reputation with the ultimate goal of deriving a sound return on investment for our shareholders. “Domestically, we will continue to work with our members in a determined effort to support the domestic capital market by expanding our ‘Own Your Share of Bermuda’ investor education programme, initiating new and creative ways to expand and diversify share ownership and increase trade activity.